A week or so ago when we had temp's in the 60°F range I told friends and family "I have to finish up whatever straggling stouts I have kicking around. The warm weather is here to stay and it's time for warm weather beers. These thick stouts just ain't the kind of thing that cut it in that kind of climate." 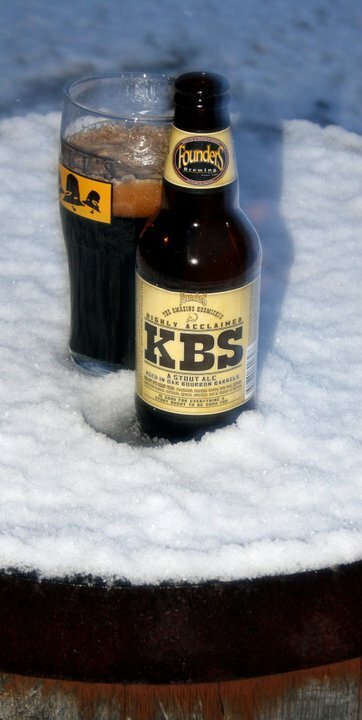 "What about KBS" It'll be in stock in a few days" a buddy who orders the beer at one of my go to party store's in town asked. "Well, that doesn't count because it's not just a stout but something close to pure manna" I said to him "but even after that NO MORE STOUTS til the old man winter weather returns." Then last night BOOM! ANOTHER FREAKING WINTER STORM. Mean, thick, heavy sleet fell down. It was some back breaking work digging the car out of the nasty and wet mess that had dropped from the skies out but it had to be done. KBS had arrived to the area. It's a rare bird and is not something that can be put off picking up "sometime later in the week" because it doesn't last long on the shelves after it's released and when it's gone IT'S GONE FOR A WHOLE 'NOTHER YEAR (unlike this freaking snow though it seems). A thin but hearty coffee with cream colored head sits on top on what has the be the darkest stout brew on this and, though it melts a bit, still hangs on all the way through the session. The aroma is first and foremost bourbon and oak wood due to it being casked in whiskey barrels for over a year. Other scents that follow it are coffee, chocolate and vanilla. The scent alone is enough to make one smile and the flavor bursts open the tastebuds senses in ways the aroma was just hinting at. The bourbon characteristics warm the tongue and body even faster than they did the nostrils. Warms the heart of a serious beer lover too as it is making me smile despite no matter where I look outside I see a six inches of cold and clumpy mass covering everything. The bourbon flavors don't overtake everything in this velvety and thick brew though as the sweetness from the chocolate and vanilla flavors and coffee bean bitters come in and balance each other out. Compared to other years this finishes with a slight hop hotness but it works incredibly with the bourbon warmth that goes along with it. Other brews attempting the same kind of thing that Founders is doing with this may try to come close but none of them can match the twists of complexities that are going on here. There's a reason why KBS gets ranked one of the top end beers of the world in places like Beer Advocate (where it currently ranks as #4). Utterly amazing stuff here. No doubt about it.